Derrick Jones, better know to the hip-hop world as D-Nice, is one of the three original member of the legendary Boogie Down Production crew (along with KRS-One and the late Scott LaRock) and he’s also married to the still very hot actress Malinda Williams (she played Bird on the old Showtime series Soul Food) Legend has it that a beef between D-Nice and another guy (apparently over a chick) lead up to Scott LaRock’s murder while trying to play peacemaker between the two. Just a factoid that you’ll find interesting or just plain random…choose your own adventure. 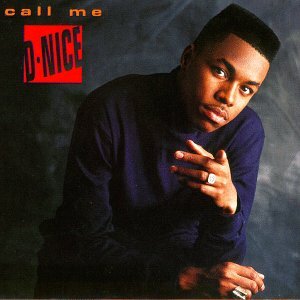 D-Nice essentially held down deejay duties for the first three BDP albums, but somehow managed to snag a solo deal with Jive Records (also the label home of BDP) and released his debut in 1990 Call Me D-Nice . But…is the project worth calling him anything? Let’s give it a listen. Crumbs On The Table – Derrick waste no time and goes straight to work over a dope instrumental (complemented by a sick bass line). No, Derrick won’t be on anyone’s top 5 list (other than Melinda Williams) but he does have a nice vocal, good energy, and a decent flow. Nice way to kick things off. Call Me D-Nice – Speaking of dope bass lines: this has to be one of the top 10 bass lines on any rap song, ever (yeah, I said it). The organ sample is pretty nasty too. This was the first single off the album and easily Derrick’s biggest hit. Derrick rides this funky instrumental beautifully, dropping some nice lines and sounds right at home. This is definitely a hip-hop classic, yo! Glory – This was also released as a single and was also included on the soundtrack for the Morgan Freeman/Denzel Washington movie of the same name about the 54th regiment the first all African-American army unit during the civil war. Derrick definitely has an ear for banging bass lines, but other than the bass line this song was kind of boring. Derrick does his best KRS-One impersonation with this history lesson but looses the listener in the process. The TR 808 Is Coming – KRS-One stops by to endorse his BDP brethren and provide the hook for this one. Derrick’s instrumental is way too empty and bland, and his delivery and rhymes (“I wear a cap and gown when I’m teaching”? Huh? WTF?) are really bad on this one. I think Malinda would even take him off her top 10 list after hearing this one. Under Some Budda’ – Derrick provides a reggae tinged instrumental that samples a Pee-wee Herman vocal, which actually works well with the content of the song. Derrick’s first two verses follow a decent story line of a rival crew trying to challenge he and his crew, leaving Derrick to believe the only reason any one would possibly challenge him to a battle is if he was smoking weed (humble, not). Then he throws in a third verse that completely abandons what he was building on previously. Never the less this was an okay listen. It’s Over – This was Derrick’s blatant attempt to gain a female audience. He invites Dawn “Jalisa” Lewis (remember the show Different World?) to sing the hook (which wasn’t the best idea) for a song about a relationship gone bad. I remember this sounding cheesy back in the day and it’s maintain it’s cheesiness after all these years. That’s not a good thing, by the way. A Few Dollars More – I’ll say it again: Derrick definitely has an ear for banging bass lines. This one compliments his funky instrumental perfectly (I love the horns over the refrain). Derrick’s back in storyteller mode as he shares a story about the choices the character “Stan” makes in pursuit of the almighty dollar. It wasn’t done with the greatest execution, but I’ve heard worse. It’s All About Me – Derrick’s in battle mode but his instrumental sounds a little too playful for anyone to take any of his boast or threats seriously. Some of his rhymes even sound like he’s dissing himself (ie. “to hang with the Nice you must be insane”). All in all, this was okay. Pimp Of The Year – I guess even BDP members have to get their misogyny on from time to time. This was supposed to be funny but it won’t even muster up a chuckle, rendering this completely useless and awkward. I guess he needed to make sure there were enough songs to make this a full length release. And You Don’t Stop – After using the first minute and a half giving shoutouts, Derrick spits one verse which sounds like an out take from “Crumbs On The Table” (based on the way he end the verse), then uses the last 45 seconds to give more shoutouts. Interesting way to end the proceedings, but probably not the most effective idea. Call Me D-Nice starts off very strong before slowly drifting into mediocrity, but to D-Nice’s credit, it never reaches the terrible stage. D-Nice displays decent emcee skills on the mic and provides pretty solid production behind the boards with a knack for adding bangin’ bass lines, but he would probably be more effective in a group as opposed to a solo artist. Then again, he was a part of BDP, where no one saw much mic time except KRS-One, which is probably why he felt it was necessary to go solo in the first place. There are several points during the album that Derrick sounds like he has absolutely nothing to say but still manages to fill out ten songs with filler material, making Call Me D-Nice a full length release when it probably would have been better suited as a 4 song EP. But hey: he did provide us with the classic title song, though, so there is a silver lining to the cloud.